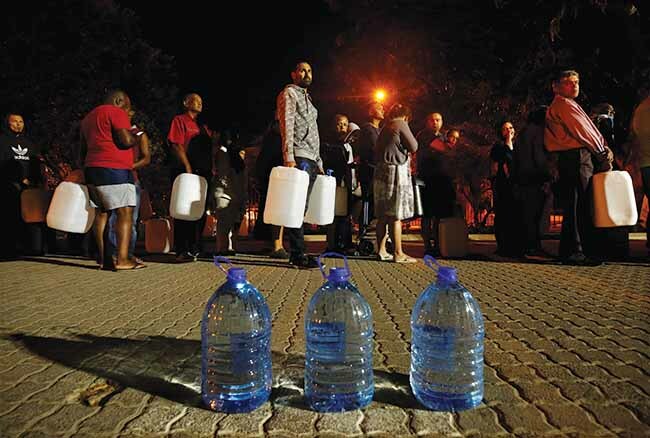 Long lines of people holding large jugs, waiting to collect clean water, were a common sight in January in Cape Town, the second-largest city in South Africa. 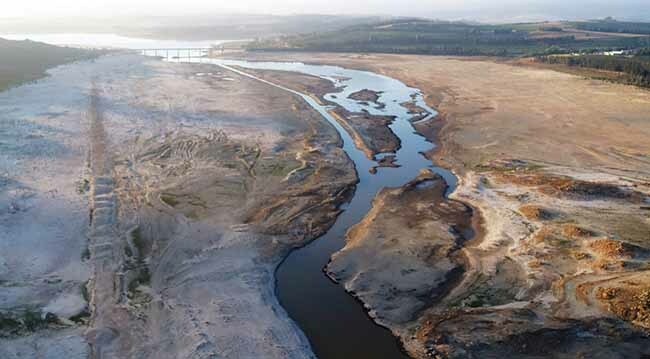 Although the relatively affluent city of Cape Town borders the ocean, potable water was in short supply, as a continuing drought wreaked havoc on the Theewaterskloof Dam that services much of the city. Water levels at the dam ebbed so low that there were fears Cape Town would soon be the largest municipality in history to shut off its taps, an event the city’s government dubbed Day Zero. But since city leaders imposed hefty restrictions—such as limiting water use to 50 liters per person daily and banning washing cars and filling swimming pools—Day Zero has not materialized. But if global temperatures continue to rise because of climate change, scientists say weather patterns that led to Cape Town’s water challenges will grow even worse. Even before the water crisis transpired, Cape Town announced its local government was accelerating its work on reducing the impacts of climate change. In November 2017, the leaders of 25 international municipalities, including Patricia de Lille, the mayor of Cape Town, announced they had committed to net-zero greenhouse gas (GHG) emissions by 2050. Scientists agree that reducing the amount of greenhouse gases such as carbon dioxide, nitrogen, and methane going into the atmosphere will be key to limiting the global temperature increase to 1.5° C above preindustrial levels, the target of the 2015 Paris Agreement. To lower emissions, significant efficiencies will need to be realized across all sectors in Cape Town. While Cape Town is not receiving any direct support from the national government toward pursuing its carbon neutrality goal, the city is planning for carbon neutrality by 2050 by updating its GHG emissions inventory and energy futures modeling. The main sectors of energy, transport and urban development, water, and sanitation and solid-waste management will be prioritized, according to Cape Town City Council Member Xanthea Limberg, who serves on the Mayoral Committee for Informal Settlements, Water and Waste Services and Energy. In 2015, the city government adopted the Energy2040 plan, which includes measures to diversify Cape Town’s energy supply to become more resilient and efficient in order to reduce carbon emissions through the year 2040. Many of the measures involve collaboration with residents and businesses. Limberg said the city intends to augment its role as an electricity distributor by adding generation capacity and contracting with renewable energy independent power producers (IPPs). “For this to happen, the national regulatory environment must be reformed. It currently does not permit municipalities to hold power purchase agreements with IPPs,” she said, adding that the city has embarked on legal action to drive this required reform. “It will be vital for the national government to liberalize the electricity-generation environment if cities are to be able to decarbonize their grid electricity through renewable power purchases,” she said. Several renewable energy initiatives already are operating in the Cape Town area, and not all of them are for the relatively affluent. In the town of Stellenbosch, which adjoins Cape Town, is the slum Enkanini, home to more than 6,000 people. Many of the residents’ dwellings have solar panels, thanks to Stellenbosch University’s iShack project. Through iShack, residents receive basic electricity services. 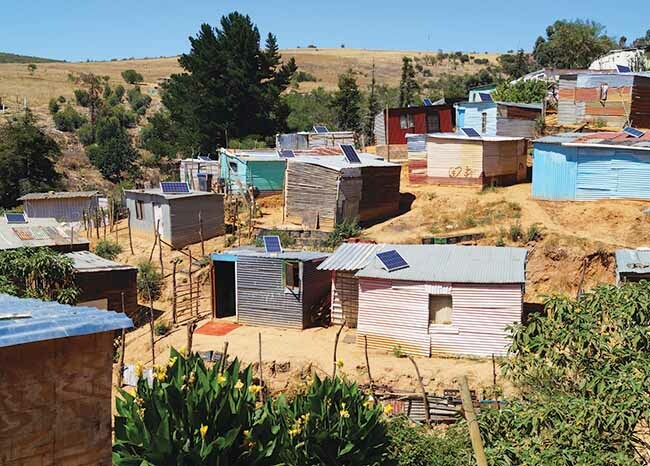 The solar home systems are partly subsidized by the Stellenbosch Municipality. While the iShack model shows potential for solar energy to expand access to electricity across the city and country in a sustainable way, David Hees, iShack’s solar utility manager, said there are a few solar projects happening in rural areas around the country with varying levels of success. Hees said the plan is to replicate iShack in other municipalities, adding the system is easier and cheaper to install than industrial applications. He also said the national government of South Africa needs to enact more policies to boost renewable energy in the private sector. Mark New, director of the African Climate and Development Initiative and AXA chair in African Climate Risk at the University of Cape Town, said the use of coal will also need to be phased out. “You think we can get zero carbon emissions in this country? We cannot if South Africa continues to get electricity from the largest carbon emitters, not until we stop having 70 percent of our primary energy consumption coming from coal,” he said. The power company Eskom says South Africa produces an average of 224 million tons of marketable coal annually, making it the fifth-largest coal-producing country in the world. There 18 coal power stations in South Africa. Even if transitioning away from coal proves extremely difficult, “we still need to get the idea of picking up on the targets we set for ourselves,” New added. One of Cape Town’s waste-management initiatives, intended to move the city closer to net-zero GHG emissions, has been to separately collect garden waste and turn it into compost. More than 20 drop-off facilities around the city now accept garden waste and other types of solid waste, like paper, cardboard, glass, and cans. There also are various recycling efforts in lower income areas. The scenic suburb of Hout Bay, 20 minutes south of the Cape Town business district, is home to more than 42,000 people, even though traditional housing for only 12,000 exists. The majority of residents live in Imizamo Yethu township, a mixture of lopsided wood-and-concrete structures overlooking the sea and relatively wealthy neighborhoods. Nokwanda Sotyantya, who has lived in Imizamo Yethu since 1993, has learned to tolerate the rotten smell of rubbish while rescuing things like a discarded but still-working television set, an old oak cabinet, or a pile of grade two children’s books. “First it was about money. Then I learned recycling was about saving the environment,” said Sotyantya, who supports a family of 10 through her work in the waste-recycling business, which she learned from her late husband, Headman. 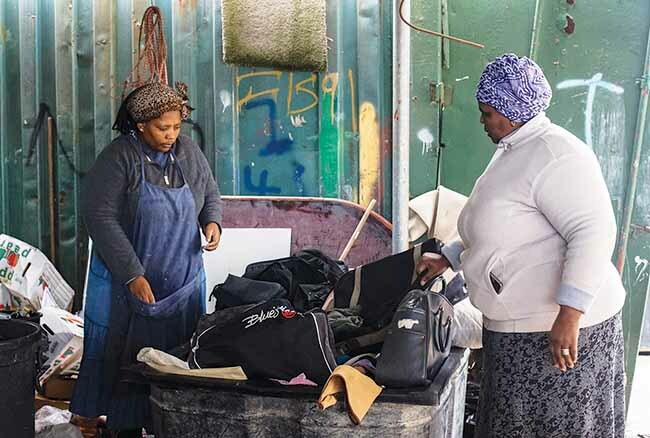 The social and environmental nonprofit Thrive Hout Bay started the Hout Bay Recycling Cooperative, where Sotyantya works, in 2009. It has five workers but occasionally employs others depending on the load. Occasionally, Sotyantya promotes reducing waste to residents through campaigns on the importance of recycling. 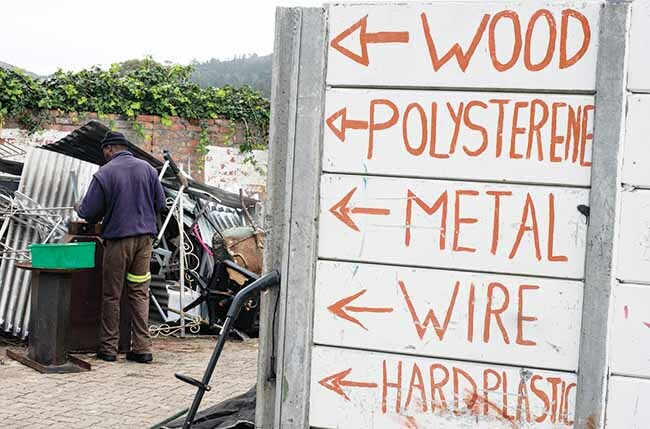 The cooperative runs on property owned by the Cape Town City Council, and each winter collects approximately 55,000 pounds of solid waste, while in summer it collects about 77,000 pounds. In winter, Thrive Hout Bay earns about $182, and in summer it earns about $254. According to South Africa’s census, most households in Imizamo Yethu have an annual income of between $1,500 and $3,000, mostly due to state grants. “We are not making a lot of money, but we never go home empty-handed, we don’t buy television sets or bags, we get them here. The good thing is some things we get here, we sell, we never go home empty-handed,” Sotyantya said. The cooperative’s biggest-ever check of $9,000 went to buy a van the workers now use to collect waste, she added. In addition to making money, the cooperative has prevented more than 2,000 metric tons of waste from going to the landfill, where it would have emitted methane and carbon dioxide into the atmosphere. Cutting energy consumption in the transport sector is critical. In 2012, the sector was responsible for 34 percent of the city’s carbon emissions, according to the 2015 Cape Town State of Energy report. City Council member Limberg said making transportation more sustainable can be accomplished by reducing demand for private trips, trimming transit times and shortening routes, making high-occupancy and shared travel more user-friendly, and improving access to and affordability and safety of public transportation. The way the population is distributed across the city perpetuates long travel distances, contributing to high carbon emissions, she said. Cape Town plans to develop charging stations for electric cars and is considering adding electric vehicles for city fleets, including 11 electric buses. City officials said the eco-friendly buses would be powered by electric batteries replacing high-emitting carbon fossil fuels, and solar will be considered for future charging stations. On the nongovernmental side, the nonprofit Open Streets Cape Town has a program called Open Streets Days, rotating periods of time when major roads in different parts of the city are closed to vehicle traffic. Open Streets Days encourages people to make the best of the car-free space to use nonmotorized transport and to experience streets as public space. “We believe that through this type of experiential learning, behavior can change, which, in our opinion, is ultimately the most important piece in the low carbon transport puzzle,” said Sindile Mavundla, Open Streets campaigns manager. Although Cape Town is prioritizing transport and urban development, water, and waste services and energy, other sectors, like agriculture, also will be important to achieving the 2050 goal for net-zero GHG emissions. 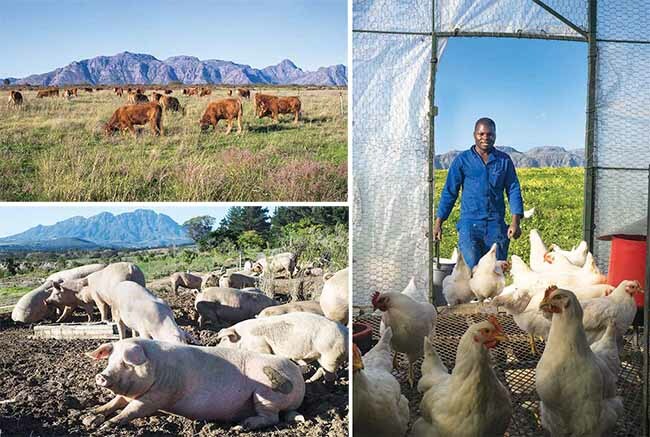 In Stellenbosch, Angus McIntosh, a management accountant turned organic farmer, believes the best place for carbon to be is in the soil rather than the air or water. McIntosh has 150 head of cattle, 4,800 laying hens, 200 pigs, and 2,800 broiler chickens that feed on natural pasture at his Spier Farm. “All that we are doing is building the carbon content of our soils through our heavy grazing of our pastures. Lots of animals feed on a small piece of land for a small period of time and leave it to recover over six weeks,” he said. 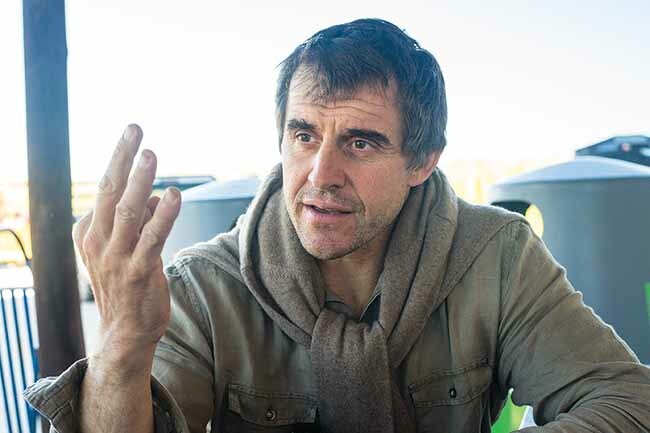 In 18 months, he managed 8,000 tons of carbon sequestration on a 73-hectare piece of land. McIntosh supports keeping carbon in the soil because it helps plants grow. He does not have to use chemicals, promoting ecological balance. “If every farmer in Africa was focused on growing organic matter, we would not have any problems. People would eat healthy food, our rivers wouldn’t be polluted, and the society wouldn’t be sick,” he said. Cape Town is not alone in its effort to reduce GHG emissions. For more than a decade, cities have shown their determination and capacity to lead the world in delivering bold climate action, said Kevin Austin, deputy executive director of the C40 Cities Climate Leadership Group. C40 counts 96 cities as members, four of which are in South Africa: Cape Town, Durban, Johannesburg, and Tshwane. C40 is working with member cities to ensure that by the end of 2020, each will have a comprehensive, measurable climate-action plan in place to deliver low-carbon resilient development that is consistent with the ambitions of the Paris Agreement. “To help cities deliver on those ambitious plans, we’re supporting cities to take action in the areas that have the highest emissions-reduction potential, including transportation, buildings, waste, water, and energy,” Austin said, adding cities are being supported to become more resilient to the effects of climate change, such as floods, droughts, and extreme heat. C40 assistance comes as direct technical support, knowledge sharing, and access to expertise developed in other member cities. “The best person to convince a mayor of the benefits of a sustainable initiative is another mayor. At the technical level, every city is a world leader in something; that is why the C40 model encourages cities to share ideas and best practices to accelerate the rollout of things that we know will work across cities worldwide,” Austin said. C40 is working with South Africa’s National Department of Environment Affairs to ensure cities can play the fullest possible role in meeting national climate targets, Austin said. C40 plans to announce the progress already made and how cities will step up climate action in the years ahead during the Global Climate Action Summit in September in San Francisco. “The message we can expect to hear from all involved in the summit is that cities, states, regions, businesses, and investors are serious about delivering on the Paris Agreement, and we expect nation states to pay close attention,” Austin said. As Cape Town’s drought continues, the city’s residents are not out of the woods. Day Zero could still happen if more measures are not taken. But Cape Town’s deputy mayor, Ian Neilson, told a biannual Water Institute of Southern Africa meeting in June that long-term thinking about how to sustainably take care of water resources is already happening, thanks in large part to the city’s experience with extreme drought and threats to potable water. “The city has been forced to revise its strategy on saving water as part of a broader resilience mechanism,” he said. It remains to be seen if climate change will continue to force Cape Town’s residents to adjust their mitigation and adaptation strategies. But, Neilson, said, the focus has to cater to future growth of the city’s population and industry. Munyaradzi Makoni is a freelance journalist from Zimbabwe who lives in Cape Town, South Africa. He writes about agriculture, climate change, environment, marine sciences, health, higher education, sustainable development, and science in general. He has written for SciDev.Net, Thomson Reuters Foundation, Physics World, Nature Index, and University World News among others.